A Week for Celebrating STEM Education and it's Role in Our Communities! South Carolina’s Coalition for Mathematics & Science (SCCMS) is excited to organize the first ever STEM Education Week! Our goal is to remind communities of the important role STEM education plays in our State. 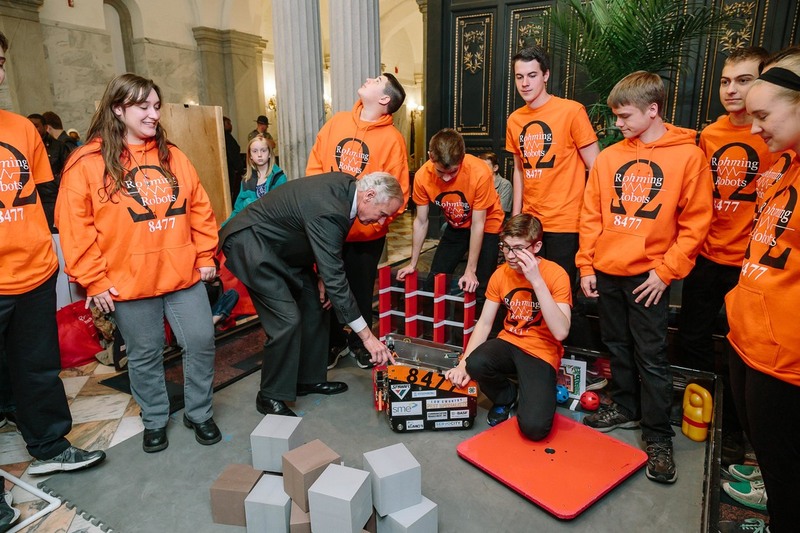 Last year we took STEM Education to the Capitol, showcasing student robotics teams, celebrating past success as well as introducing new initiatives. This year, we are expanding our efforts with a full week of daily activities geared toward school and community participation. Join fellow STEM enthusiasts and schools around the State in the 2019 South Carolina STEM Education Week! MONDAY: Raise Your Voice for STEM Education! Raise your voice and shoot a quick email to your legislators, encouraging them to continue supporting STEM education during this legislative session! Not sure who your legislators are? Use this link to easily locate your representatives. Short on time or not sure what to write? No worries. Simply start with our sample email and customize it to fit your message. Your voices have a great impact on our legislators who are interested in knowing how supporting STEM education leads to a better prepared workforce and brighter economic outlook for our state. Opportunities in STEM career fields such as Advanced Manufacturing, Computing, and Engineering continue to grow in South Carolina. STEM learning in schools, in afterschool programs, and in a wide variety of formal and informal learning settings all contribute to an informed citizenry, a workforce with increased knowledge and skills, and a better quality of life for all. I ask you to support STEM teachers and learners in this 2019 legislative session by_____________. I value your leadership as a legislator and look forward to working with you to support the STEM education this year and every year! The STEM Teacher Fellows program aimed at retention of mid-career teachers proposed by South Carolina’s Coalition for Mathematics & Science and approved by the Education Oversight Committee. Tax credits for business/industry that employ STEM educators from any grade level as interns. The creation of a professional development fund targeted to assist STEM teachers, with special emphasis on middle and high school mathematics teachers, in developing interdisciplinary, project-based instruction and assignments that engage students in applying science, computational thinking, engineering and mathematics skills to solve problems. If you can’t be present at the Capitol, we want to hear from you! Send us a video or comments on why STEM education is important to our state, why students need a strong STEM education, why business/industry needs graduates qualified to work in STEM-related fields, and/or how STEM impacts South Carolina's economy. Wednesday is all about sharing. Throughout the day, we’ll be posting videos and messages from students, educators, community, and business/industry professionals on how STEM education impacts our state. Keep checking our social media feeds throughout the day and share these messages with your community. THURSDAY: Show Us Your STEM! Calling all classrooms, afterschool programs, clubs, homes and communities. All are encouraged to participate and capture images of individuals and groups engaging in a STEM activity, STEM lesson, or STEM in the workplace and/or community. Don’t forget to take a few photos or a video and post to Facebook using #STEMWeekSC. Educators, need help with resources? We’ve got you covered. Download our resource flyer. Friday is all about carrying it forward. Everyone is encouraged to submit an electronic commitment card, committing to one action item to sustain quality STEM education and learning throughout the year. Participating in the science fair. Attending a STEM summer camp. Learning about STEM careers in South Carolina. Interviewing a STEM-professional in their community. Joining a SC Grand Challenge Action Team. Volunteering at a STEM event. Participating in a STEM festival. Developing and teaching an integrated STEM unit. Writing a grant for a new STEM initiative. Taking steps toward becoming a STEM-certified school. Hosting a STEM night at your school or community club. Visit an AdvancED STEM-certified school. We want you to succeed with your commitments. Contact your Regional S²TEM Centers Office if you need help getting started! After STEM Education Week concludes we’ll be summarizing and sharing the commitments with our community and legislators. Go get ready South Carolina! SC STEM Education Week is coming! 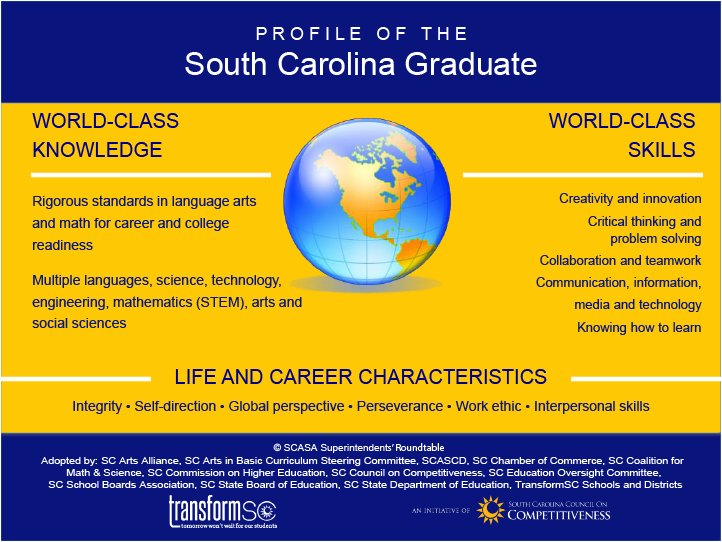 Let’s show our state why STEM education is so important especially for our students and their success toward the Profile of the South Carolina Graduate.